Massive cuts lawmakers made last year to family planning funding in Texas caused more than 50 clinics statewide to close, according to a report published by the New England Journal of Medicine on Wednesday. More than 50 clinics that provide family planning services have closed as a result of state budget cuts, according to a report published Wednesday by the New England Journal of Medicine. “We are witnessing the dismantling of a safety net that took decades to build and could not easily be recreated even if funding were restored soon,” states the report, which was produced by sociologists at the Population Research Center at the University of Texas in Austin as part of a three-year study of the impact of budget cuts to family planning services in Texas. State lawmakers cut funding for family planning services by two-thirds in the last legislative session, dropping the two-year family planning budget from $111 million to $37.9 million for the 2012-13 biennium. They also approved a tiered budget system for family planning funds, which gives funding priority to public health clinics, such as federally qualified health centers and comprehensive clinics that provide primary and preventative care over clinics that only provide family planning services. As a result of the funding cuts, 53 out of 240 clinics that have received public funding to provide family planning have closed, and 38 have reduced service hours, according to the report. In addition, the report states, many clinics are now charging for services that were previously free, raising prices for other services and restricting access to more effective methods of contraception that are more expensive. To meet the requirements of the new priority funding system, the Department of State Health Services told the researchers that the state stopped funding 35 of 76 family planning clinics in the 2012-13 biennium. 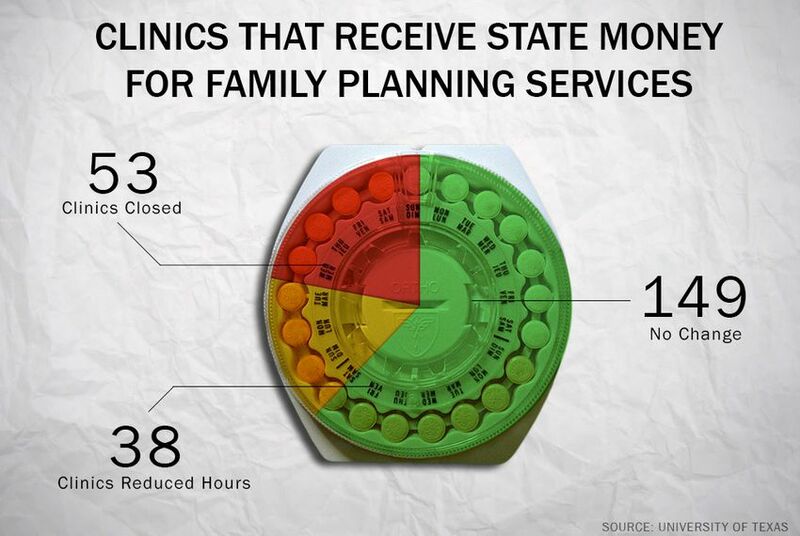 The budgets of family planning clinics that still received funding were reduced by up to 75 percent. As a result, about half of the clinics that closed — 25 — were family planning clinics, according to the report. State Rep. Bryan Hughes, R-Mineola, said at The Texas Tribune festival on Saturday that many programs took financial hits last session because of the state's budget shortfall. Funding that was cut from family planning "went to pretty noble places," such as programs for children with autism. He also said the tiered funding system lawmakers implemented has brought new women's health providers to his rural district. But state Rep. Donna Howard, D-Austin, disagreed with Hughes. She said family planning providers in her district have told her that many clients can no longer afford to see them because they have to charge for services that were free before. "We have the highest uninsured rate in the country," Howard said at the festival. "If we want people who do not have the means to provide their own health care to be able to be healthy productive citizens, then, absolutely, we need to be looking at supporting family planning." Local governments, hospitals and doctors know the cuts to family planning will have major impacts on their communities, said Dr. Joseph Potter, a sociology professor at UT and one of the joint authors of the report. “They think it spells more births, more costs, more unintended pregnancies, more people in emergency rooms. They’re concerned about that, and in many cases are trying to cover the shortfall,” he said. Potter said that as the three-year study continues, they will also examine the impact of the family planning budget cuts on the number of births, unintended pregnancies and abortions in Texas — and the related financial consequences, such as increased expenditures in Medicaid. “We’ll just see the first inkling of that … by the next session of the Legislature,” Potter said.